Speaking of Deschutes... Their Class of '88 Imperial Smoked Porter -- another in the current Class of '88 series -- has recently hit the shelves. This one was created in collaboration with Great Lakes's brewmaster, and yet again it's a big beer weighing in at 9%. Hey, nothing wrong with that. Is it any good though? Sort of. It's not quite there, but I assume aging it might bulk up the rather puny body. Yet aging smoked beers can be a gamble, as the smoke often times bulks up right with everything else. A philosophical debate could be had here, but let's not get ahead of ourselves. The Imperial Smoked Porter is certainly not a bad looking beer; deep black with a tan head. Sniff, and the smoke kicks you in the face, while the friendly malts come to the rescue, putting a band aid on the wound. Give it a sip, and I, at least, found myself left with mixed feelings. The flavor is good, with a dominant smoke finding itself flanked by nice hints of chocolate. There are some subtle hints of anise just at the back too. I would assume the latter would make its way forward with aging. And here we are again: The aging, something I really think is needed here. "But you told us it tastes good! ", you might yell, and yes, it does taste good. The body is where it falls flat. An imperial stout needs to be close to being on steroids to really work, otherwise you just have a few pleasant flavors slurping around, mocking your palette. That might seem minor, but it really isn't. A thin imperial is like an anorexic Olsen twin; it's just somewhat sad. Ane some aging might just be what is needed here, as long as the smoke doesn't grow up to be too insane. We'll see. For now the Imperial Smoked Porter is worth a shot if nothing else, just don't expect greatness. 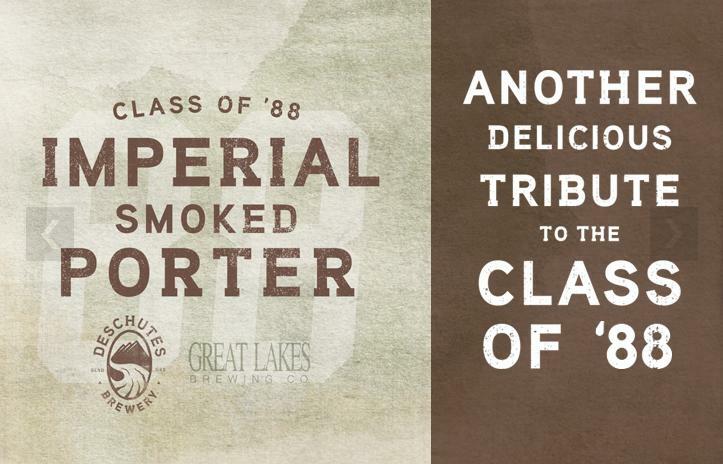 Do you recommend Deschutes Class of '88 Imperial Smoked Porter? Make your voice heard!